Over the Fourth this year our family traveled to Glacier National Park to spend a few days exploring the wild. Before the trip, I searched blogs and the interwebs to get a sense of what the park would be like and to prepare for what to pack. I found some good advice, but to be honest, nothing prepared me for what GNP is really like. So here’s my take on it all and advice for if you’re planning a trip there. A little bit about our travel style. In our family, there are two adventurous people and two…less adventurous people (with a touch of diagnosable anxiety). We all have an appreciation for nature. We like to go on hikes and be outside. We don’t mind sweating a little bit. Hubs is pretty athletic and I’m kind of a hippie at heart. But it turns out I am not GLACIER hippie and even Hubs isn’t GLACIER athletic! I did not use the word “wild” above lightly. There is actual WILDlife floating around Glacier and you might just cross paths with it when not in the safe cover of your vehicle (much unlike Glacier’s sister park to the south, Yellowstone). The trails involve some amount of effort and agility to manage. Hubs and our adventurous little one went out to the Hi-Line trail just to say they did and when Hubs got to the part where the trail turns into a small ledge on the side of a rocky cliff with a cable to hang on to 7,000 feet above the earth, he said his legs were shaking. They grabbed the cable, took a picture, and turned around. WHO DOES THAT FOR 7 MILES?!? Not I, said the little red hen. With that said, there is no place we’ve visited like Glacier. The views are stunning. And if you’re willing to get off the road a little bit and are brave enough to be vulnerable in nature, it really is quite the experience. If you’re reading this and think you want to try the Hi-line, you can stop now because I got nothing for you, my friend. You go ahead with your bad self! View from close to Logan Pass looking west. We drove from our home in western Minnesota which was a solid 16 hour drive mostly on I94 and I90. Instead of doing it all in one day, we split up the trip there and back in about a day and a half. We spent the first night in Bozeman, my favorite town in all of Montana. 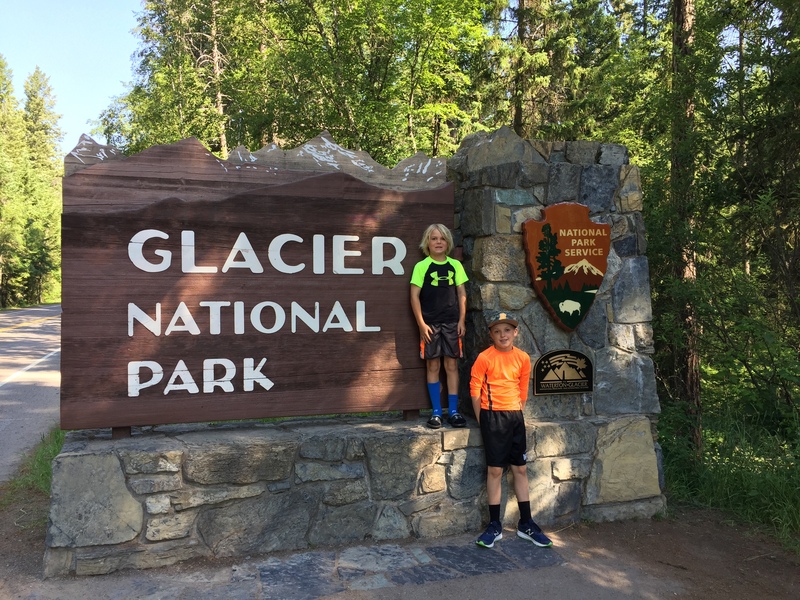 We thought we’d leave Bozeman bright and early on day two and arrive in Glacier around lunch time to give us two and a half days in the park. Well, that didn’t happen. Instead we took our time, stopped in Missoula for lunch (my second favorite town in all of Montana), and didn’t arrive in Glacier until around 4:30 in the afternoon. Whoops! So we really only had a little over two full days in the park. Since the fourth of July was on a Wednesday this year, our trip was mid-week. We spent Tuesday evening through Friday morning visiting the park. We were prepared for it to be busy given the holiday, but we had no trouble at all getting into the park until Friday morning. Fortunately we arrived around 9:30 and the line was manageable. We only returned to get the boys their Junior Ranger Park badges that we weren’t able to get the evening before because we stayed too late. By the time we left, around 11:00, the line on the west entrance line was backed up onto the highway for further than the eye could see. Miles. Yikes! Don’t go on the weekend I guess. Even though it was early July, it snowed in some parts of the park the day before. It felt more like early spring than mid-summer. Some of trails we went on were snow covered and some trails had just opened. You don’t expect to have to deal with snow anywhere in America on the Fourth of July. But Glacier, is the exception. That also makes it tricky to pack for, but more on that later. If you want to see all of the park, don’t plan on going much earlier than July is what I’m saying. Walking up a snow covered Hidden Lake Overlook Trail. We did not stay in the park as everything was full when we finally booked – you know, late, in typical Martin travel planning style. Instead we stayed at the brand new Country Inn and Suites in Kalispell. Actually, it wasn’t even IN the town of Kalispell. It was in between, right in front of Glacier Airport. You can’t miss it. Despite being right next to the airport, we never heard a single plane take off or land. It was a great spot, only about 20-25 mins drive from the west entrance, and very nice hotel. Being brand new, everything was clean, the small pool had a slide that was perfect for our boys, and the free breakfast was delicious. I would highly recommend it! A bonus to staying outside of the park is that we got to see a little bit of the small towns around the park. Columbia Falls was my favorite. There’s a coffee shop there called Montana Coffee Traders on the south side of Highway 2 that you MUST visit if you like coffee. There’s no drive thru, so you know it’s good. Bring your own mug and serve yourself coffee before heading into the park. Or sit down, order yourself breakfast, and shop their unique gift shop area. They’ve got some super cute stuff! One of the best advice I read on what to pack for Glacier was to WEAR LAYERS! And that is no joke. I recommend adding Essex and Kalispell to your weather app on your phone a week before your trip and check out the temperatures there every day. It can be 20 degrees cooler up at Logan Pass than it is at the entrances. Our first full day the temp barely reached 60. We were in leggings/pants and hoodies, wishing we had our jackets. The next day it was in the 80’s, even at Logan, humid, and we were all sweating in shorts and tees/tanks. If you plan on doing any of the trails, even the easy ones, wear flexible, breathable, athletic type clothing. Although we didn’t experience this, I read that the weather can change quickly sometimes in the park so be prepared for any type of weather at all times. Bring a couple of good pairs of shoes, including hiking boots if you have them. We wore tennis but they got wet the first day hiking in the snow. But even on non-snow covered trails, we walked through brooks and next to rivers where our feet got wet if we weren’t careful. Throw an extra pair of socks in your hiking bag to bring along with you. Clothing – breathable, flexible, layers, poncho for rain, hooded jacket. Waterproof tennis or hiking boots, extra socks. Hat and Sunscreen – some trails are full sun exposure, and even if it’s cold/snowy, the sun bounces and is powerful. Refillable water bottle and extra water if you run out before you get to a lodge. And finally, BEAR SPRAY!!! Let me say that again. DON’T FORGET THE BEAR SPRAY!!! Bear warning at the head of every trail. Even though we got to the park late on our first day, we had quite the experience. 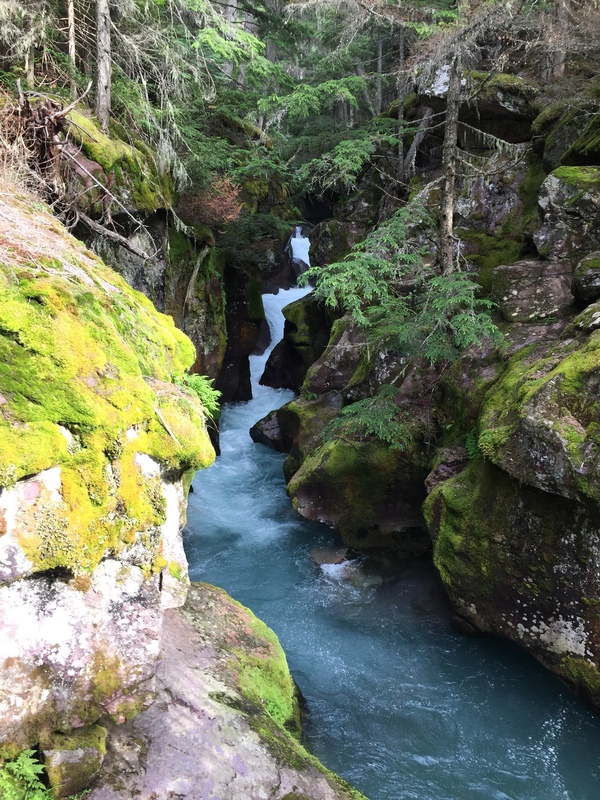 We stopped at Apgar Center and took the advice of a ranger and did John’s Lake Loop trail in the Lake McDonald area. It was a short 2 mile loop trail that we had plenty of daylight to do. 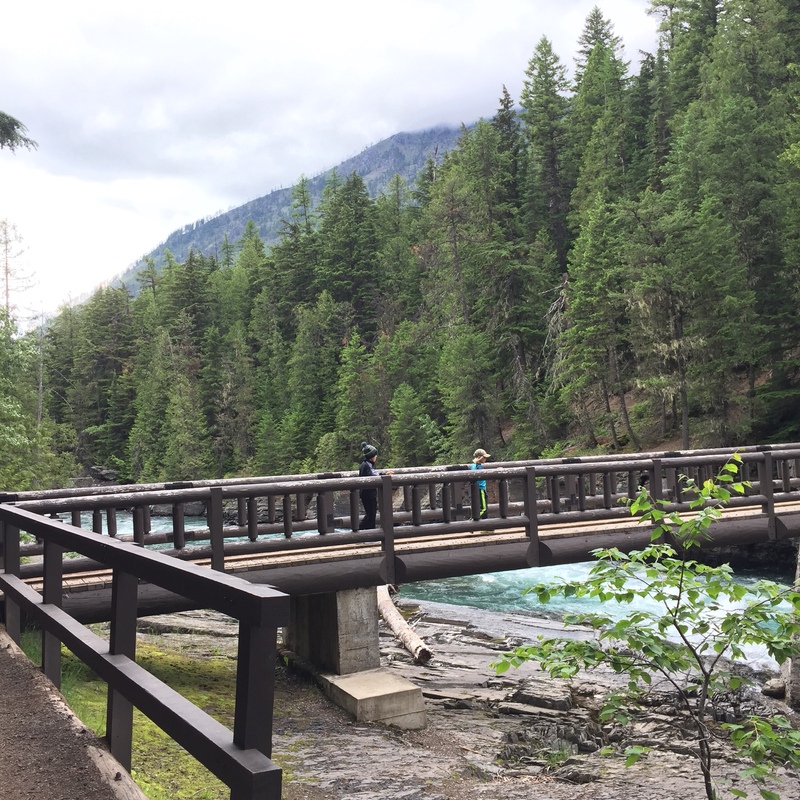 About half way through we crossed the Going to the Sun road and came to a footbridge over a small falls area of McDonald Creek. The boys went out on the bridge and I hung back taking pictures of the falls and the boys taking in the scenery on the bridge. Just as I was getting onto the bridge, I hear a guy behind me half yelling in the direction of the rest of my family on the bridge “Hey guys, hey guys, get back! Get back!” And then I saw it. The black bear on the rocky river bank about 20 yards from my children now moving in their direction. Hubs had just seen it too and they were all slowly backing off the bridge towards me. (While I was practically running away repeating “Oh my God!” Apparently I am not a person you want around you if you come across a bear. Every man for himself!) 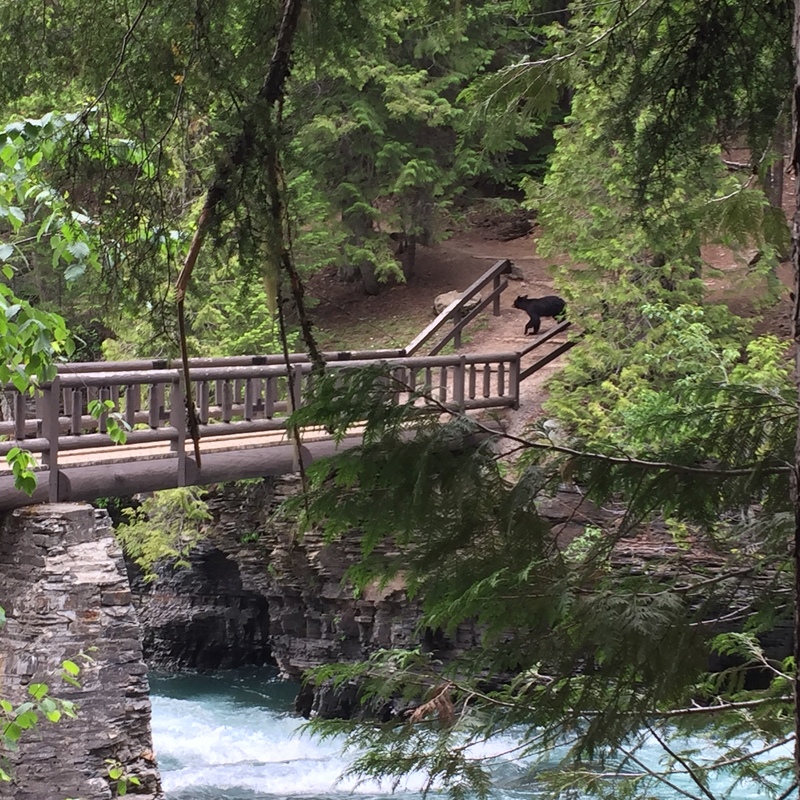 The bear came to the edge of the bridge, sniffed his nose in the air, and then made his way on down the trail on he other side of the creek. The rest of the loop trail that we were supposed to take back to our car, but at least we could turn around and get back there that way. I, nor my children, had ever seen a bear in the wild before. It was exciting and terrifying and awe inspiring. It also made me anxious the rest of our trip. We saw two more bears, grizzlies, from the car, and were warned of another grizzly on a trail we were hiking in the Two Medicine area on day two. I made Hubs turn around and take a different trail. A black bear was enough for me. 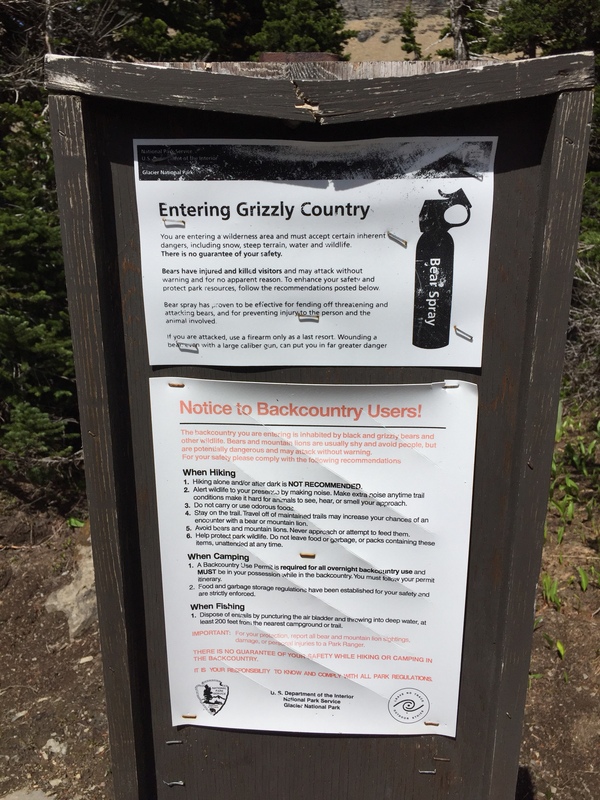 I wasn’t about to knowingly cross paths with a grizzly, even with my bear spray in hand (literally). He and our adventurous one were a little annoyed with my and the anxious one’s lack of enthusiasm about the whole ordeal. After we turned around we passed young couple hiking with a baby in a carrier. I told them about the grizzly we were warned about and they said “Oh cool!” and kept walking. Some people. At the end of day two we decided to go back to the John’s Lake Loop area and hike the part of the trail we missed after the bear encounter, just walking out and back. When we were on our way back, which was the side of the creek where the black bear had been, we heard some commotion high up in a tree off the trail and a large branch broke off and came crashing down. We never actually saw a bear, but we high tailed it out of there making lots of noise and happily bid goodbye to Glacier hiking trails. Going to the Sun road is the main road through the center of Glacier National Park. People come from all over the world to drive it. If you are afraid of heights, you may struggle with this one. 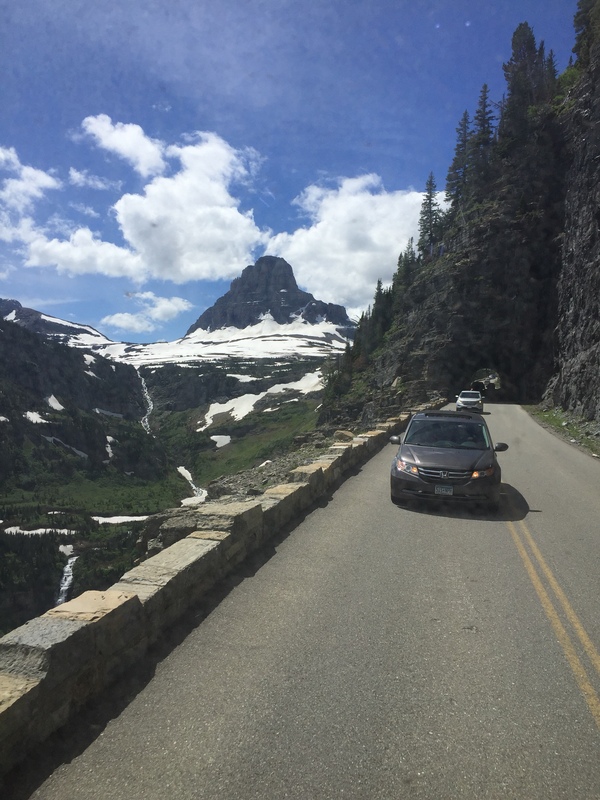 Between Logan Pass and The Loop, the road is very narrow, with a rock on one side and cliff that drops several thousand feet on the other. The guard rail is about two feet high and there are limits to the type of vehicles allowed to travel it. But the views from the road are breathtaking! There is a free shuttle that travels between Apgar and St. Mary’s, with several stops at points of interest along the way and a transfer station at Logan Pass. I highly recommend taking the free shuttle before attempting to drive Going to the Sun. Shuttles run about every 20-30 mins at different stops. Going west to east, it’s best to start at Apgar and go all the way up to Logan and then make your stops going back down/west as the shuttles tend to fill up and you may have to wait to get on if you’re trying to do so at Lake McDonald, Avalanche, or The Loop. Also, GET THERE EARLY!! Parking lots at the lodges fill up fast. If you drive the road, it’s easiest to drive from east to west, because at least you’re on the inside of the road next to the rock. However, the only way to get to the east entrance from the west is to do the southern loop which takes about an hour and half. What I’m saying is, schedule for travel time. We did not get to do as much as we wanted simply because we spent a lot of time getting to places. Also, if you drive, know that Logan Pass parking lots is full usually from 9:30 in the morning to late afternoon. The day we drove, we wanted to stop and use the rest room here. Hubs and I had to take turns driving around the lot because there was nowhere to park. Aside from driving or taking the free shuttle, there is a Red Bus Tour that you can pay for that has different options for travel routes. We didn’t opt to do this as it can be pretty spendy and it doesn’t stop to let you out and explore much. But it’s a great option for those that want to take in the amazing views from the road without getting out on the trails. And if the weather cooperates, they can fold the top back for an open air experience. McDonald Lodge and one of the buses for the Red Bus Tours. The park also has boat tours on some of the lakes around the park. If you do these, book your tour online ahead of time, even if it’s just a day ahead of time. I recommend stopping at one of the nature centers and speaking with a ranger before you do any hikes. They can suggest trails that are geared toward your specific needs and tell you where you might see wildlife. I also highly recommend taking a picture of the trail map at the trailhead for whatever you do. Just in case. We didn’t get to see as much of the park as we wanted to, specifically the Many Glacier Area. But, of what we did see, here were our favorite spots and are perfect if you’re traveling with kiddos. 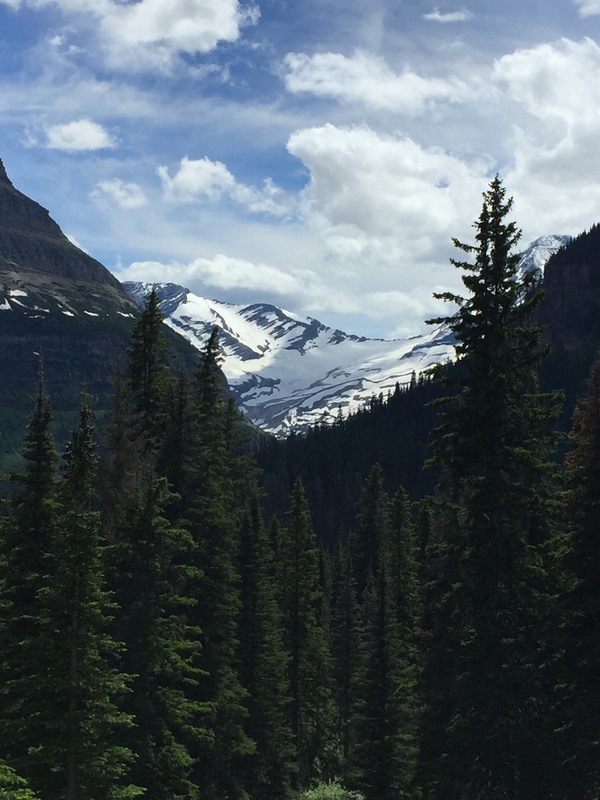 Trail of Cedars and Avalanche Trail – My absolute favorite. It’s like an enchanted forest. This is the furthest inland red cedars grow in the U.S. 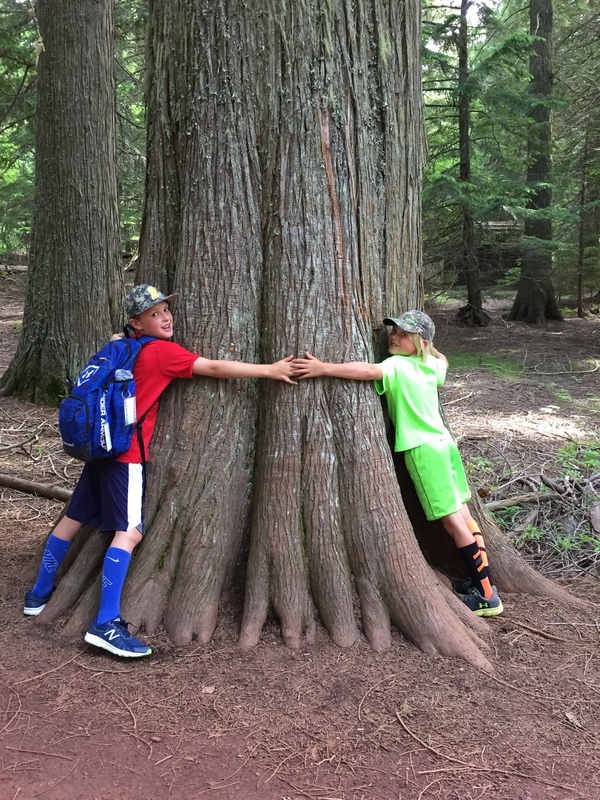 The Trail of Cedars is one of the only handicap accessible trails in the park. If you want a little more, keep going on Avalanche Trail to see the falls. Beautiful! 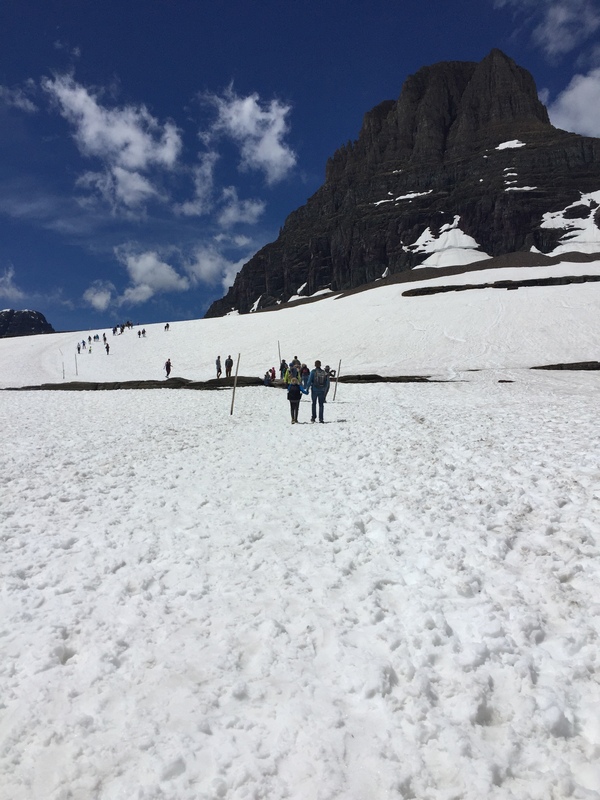 Hidden Lake Overlook/Trail – This was the snow covered trail on our trip. It’s and out and back Trail. You can hike uphill to the Overlook and then continue downhill to the lake. It’s about 6 miles round trip. Look for mountain goats and big horned sheep. There’s also wolverines in that area but they’re rarely seen. Trailhead is at Logan Pass. Parking lots fills up fast so go early! John’s Lake Loop – Short, easy, and rewarding. Bring your bear spray! Paradise Point in Two Medicine – This is a short but rewarding hike. It’s access is at the South Shore trailhead. When the trail splits, you can continue on to see Aster Falls, if the Grizzlies aren’t out. 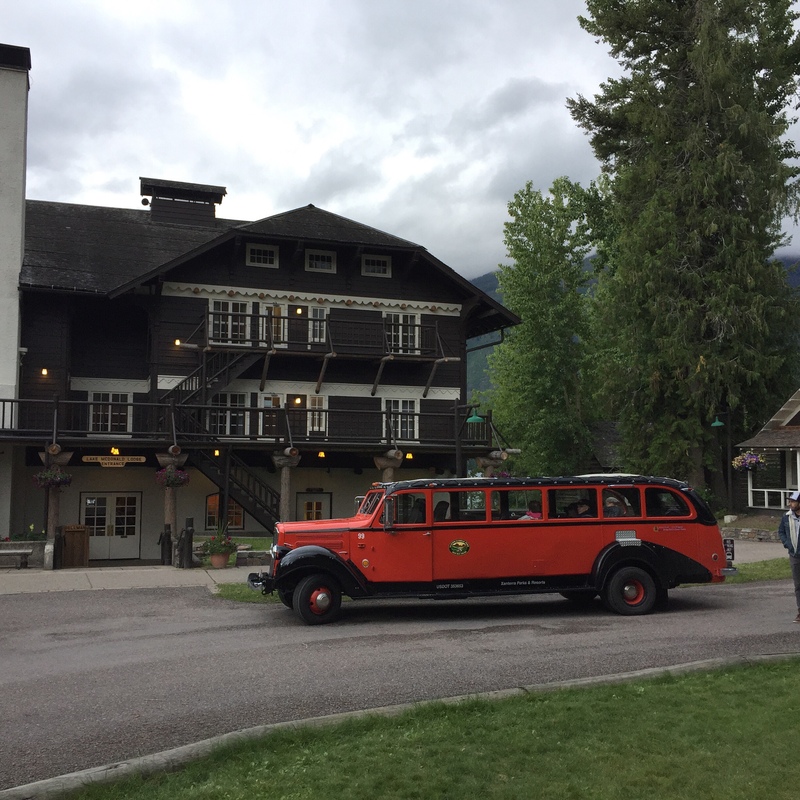 Lake McDonald Lodge – If you appreciate rustic architecture, it’s beautiful here. The food at the restaurant is really delicious and they offer several game options if that’s your thing. 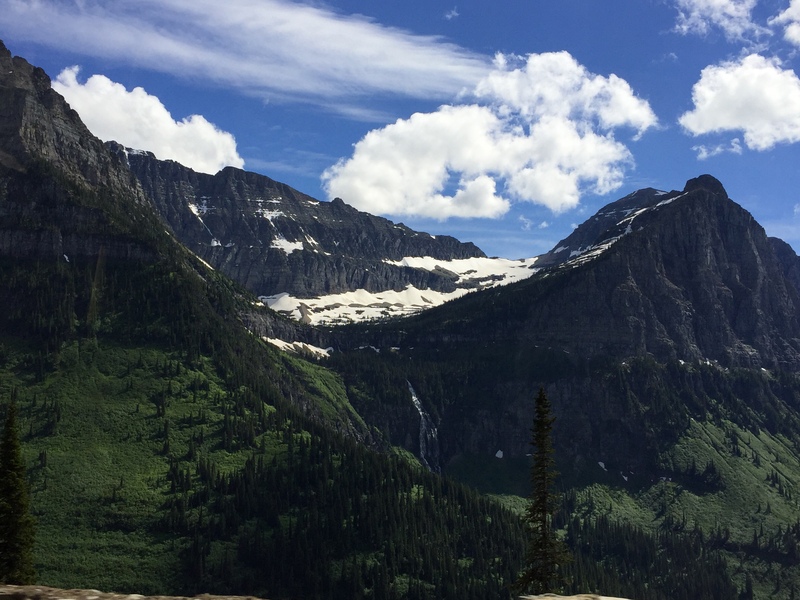 Jackson Glacier Overlook – The only (I think) Glacier you can see from Going to the Sun Road. View of Jackson Glacier from the Overlook point on the side of Going to the Sun Road. 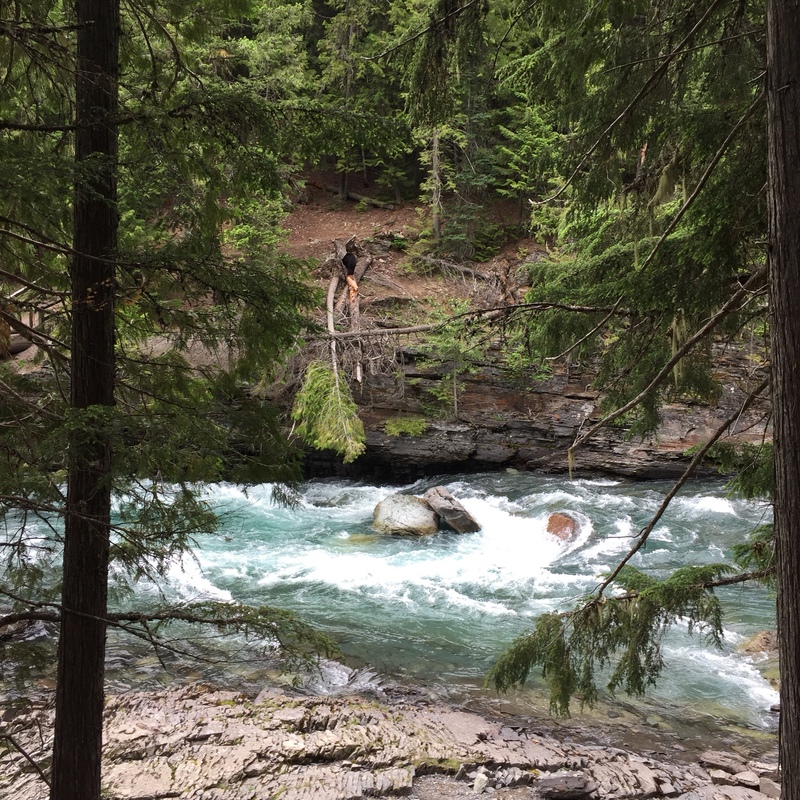 St Mary Falls – Two miles round trip and if it’s hot, bring your swim suit. If you’re adventurous, you can cliff jump! This is in an area that was burned last year so there’s little sun cover on hot days. St. Mary’s Lodge is a great educational spot to learn about the disappearing glaciers and the Native American tribes in the area. I REALLY wish could have made it to the Many Glacier area. 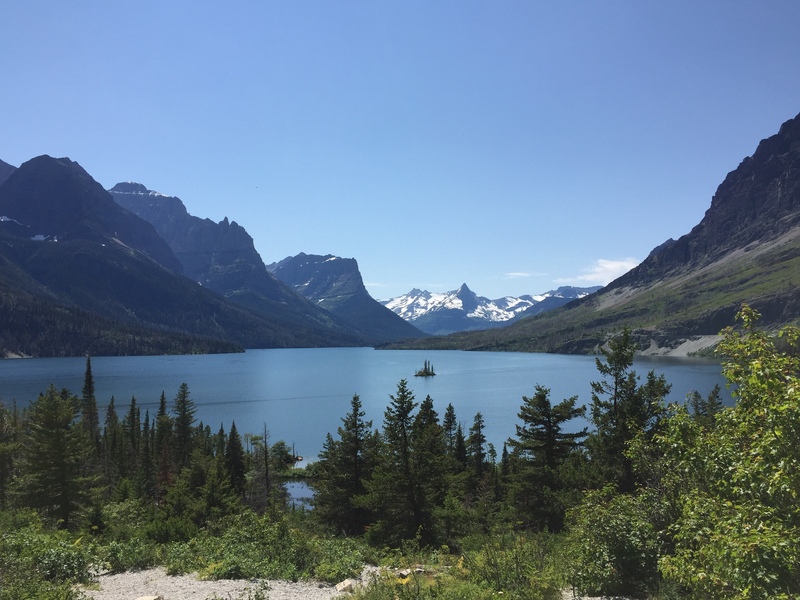 I read lots of great things about Grinnell Lake and surrounding trails. If you go, let me know what you recommend. We’d love to go back!